Arctic cruises to Svalbard and the Norwegian archipelago’s largest island of Spitsbergen have always been in high demand here at WILDFOOT, and the story of our travel advisor’s latest trip to the region helps to demonstrate precisely why. Brace yourself for her retelling of the first two days of yet another incredible journey. Our flight into Longyearbyen, the main town on Svalbard’s main island of Spitsbergen, arrived in the early hours of the morning so of course it wasn’t at all strange that it was dark! 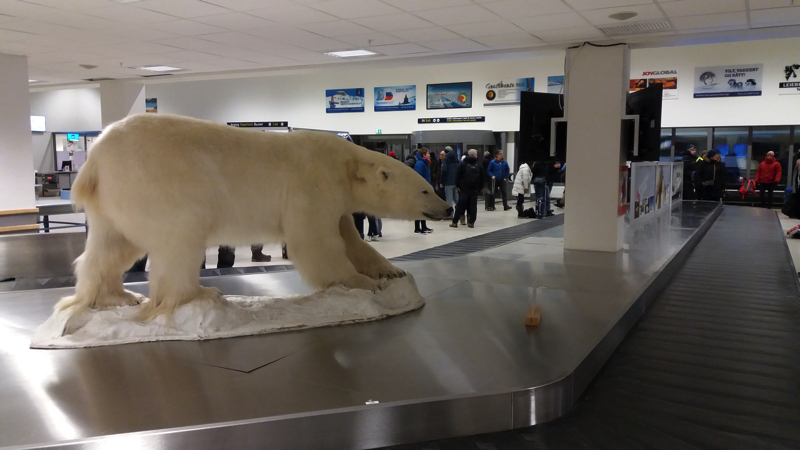 There to meet us at the luggage carousel was the first of what turned out to be many stuffed polar bears in Longyearbyen. Stepping out of the airport the temperature was decidedly fresh but not as bitterly cold as I was expecting – perhaps because the air is so dry? Checking into our accommodation, the Coal Miner’s Cabins, my main concern was: would it be warm enough? I needn’t have worried; it was toasty! Once fully kitted up for the cold we had a brief introduction to snowmobile handling and then were off! Riding a snowmobile is pretty easy actually – like riding an automatic scooter but more stable – there aren’t any gears and you don’t really even need to use the brakes, just ease off the gas if you want to slow down. 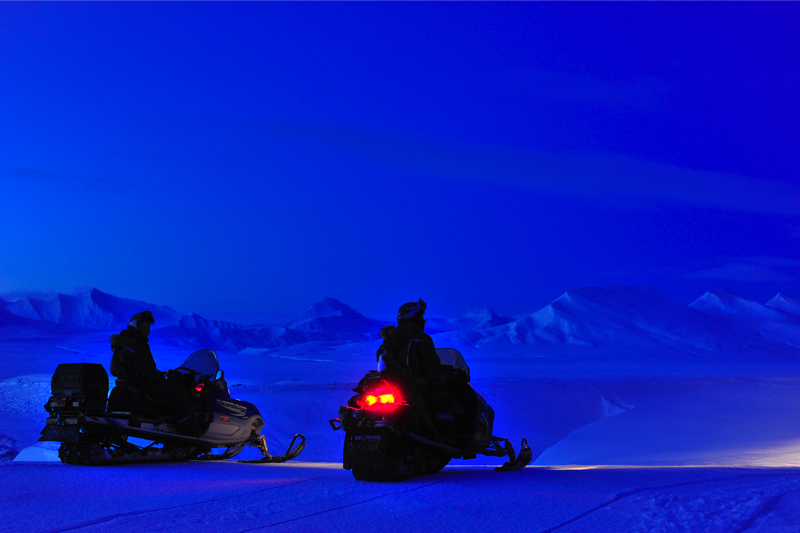 Our snake of snowmobiles twisted off into the darkness of the Advent Valley, a line of light in the black of the polar night. In late January, in fact there is a little light in the sky; for around an hour and a half at midday the sky turns from black to a beautiful dark blue, with just enough light to hint at the shapes of the magnificent snow covered mountains lining both sides of the valley. I can’t deny that the whole experience left me a tad chilly (multiple layers, balaclava and heated handlebars notwithstanding) however it was utterly magic to experience the wildness of such a pristine and deep-frozen landscape.